How the Monster Deliciosa is doing. This is the story of my Monstera Deliciosa. 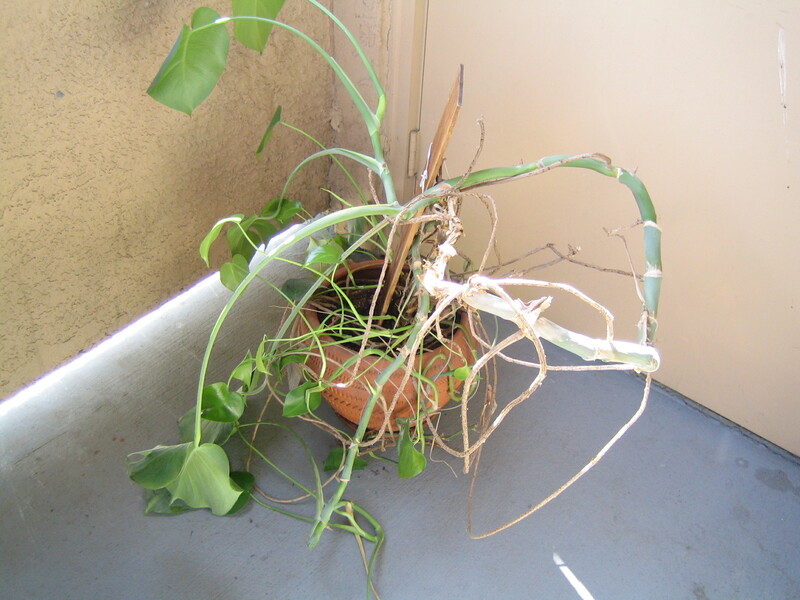 I received this very sad plant at the end of April 2013. There was a lot of dead stalks, leaves and it was just in very sad shape. The plant was given an extreme trim. And the cuttings were put in a glass pitcher to root. These cuttings spent maybe 2 months in water to see if they would root. Some of the cuttings just rotted instead of rooting, and the ones that were left did not have much to show for it, as far as roots go. I had gotten a reasonable large plastic pot to plant these in. A small trellis was provided for some stability as this plant becomes more of a vine. But the pot was so empty. So I planted some Morning Glories to climb the trellis and hopefully flower. They are just now coming to flower. I also planted some scarlet zinnia. The hope was that these would come to flower this fall. Granted I am in California, so the likelihood that I will get flowers before it gets too cold, is great. The original cuttings from the monstera deliciosa have started to grow. The leaves are not very big yet, but I am excited that they are growing. When the morning glories die back I will pull them so the baby monster can have more room. Exciting! I love rescuing a plant.